Super 8 Short is a special bonus feature in the upcoming home entertainment release of Frankenweenie which delves into the short films that Victor shoots with the help of his dog Sparky. Director Tim Burton made similar super 8 films when he was growing up in Burbank, CA. Check out the Super 8 Short bonus clip as well as an interview with Tim Burton below. In the interview Burton shares whether he dreams in black and white or color, memories of his childhood dog, what scares him & much more! After unexpectedly losing his beloved dog Sparky, young Victor harnesses the power of science to bring his best friend back to life – with just a few minor adjustments. He tries to hide his home-sewn creation – but when Sparky gets out, Victor’s fellow students, teachers and the entire town learn that getting a new ‘leash on life’ can be monstrous. Boasting an electrifying variety of bonus materials on Blu-ray and DVD, the stop-motion animated masterpiece is filled with quirkycharacters and unexpected twists. The madcap movie features an all-star cast including the voices of Catherine O’Hara, Martin Short, Martin Landau, Charlie Tahan, Atticus Shaffer, Robert Capron, Conchata Ferrell and Winona Ryder. Frankenweenie is described as a semi-autobiographical project. Does this mean the younger characters in the movie are based on your classmates from school? The kids in the movie are based on various real people, but they are also based on horror icons like Boris Karloff, Peter Lorre and dubbed Japanese movies that I remember seeing as a child. They relate to movies and actors, as well as real people that I remember from my childhood. The main character, Victor, loves to make movies. Is that what you used to do when you were a child? Yes, I did. A lot of kids did, actually. It was a fun thing to do, and it became a very easy way to get good grades. What movies did you make? Sometimes I’d make stop-motion movies and sometimes I would make live-action movies. Sometimes I filmed drawings, or I did a mixture of things. Were you also into science projects, just like Victor in Frankenweenie? I liked the idea of making things and creating things, but I guess I always treated science and art as quite similar thematically. I feel like the idea of science and short filmmaking, and doing science fairs and projects like building volcanoes, is all in a similar vein. Did you have a pet dog like Sparky when you were a child? When I was a child, I had a really strong connection with a dog we named Pepe. He was a mutt who was ill for a very long time. Is Sparky based on Pepe? This dog is nondescript. He wasn’t meant to be like a literal translation of my dog. He is more of an emotional translation. Do you have any dogs in your life now? Right now, I don’t have a dog because I travel a lot and I don’t want to leave it abandoned while I’m away. Has your family got any pets? My kid has a tortoise and three terrapins, but that’s about all we can handle at the moment. When it comes to Frankenweenie, why did you decide to create the movie in black and white? I find black and white very beautiful. It gives a real sense of emotion. I was really excited about seeing this in black and white because there’s a depth in the black and white, which I love. I was very happy that the studio went along with the idea. If they wanted it in color, I wouldn’t have done it. Do you dream in black and white or in color? I’ve had black and white dreams, as well as color dreams. I’ve had both. I love black and white; I always have. I think there’s a real beauty to it. It’s not right for every project, but when you take the color out of something, sometimes you start looking at other things like textures andcharacters. It does something really interesting. Frankenweenie is an homage to black and white monster movies from the past. Did those movies scare you as a child? I think I was more scared by real life rather than movies. I could watch a monster movie fine, but I’d be terrified if I had one of my relatives come over. I was never scared by monster movies because I felt like the monsters were always the most emotional characters – at least in those old films. I guess it’s slightly different these days. What about spiders and bugs? Do they scare you? I’m not a big fan of spiders or rats and things like that. I got up one morning on a vacation recently and there was a huge centipede in my bed. I wasn’t very happy about that. 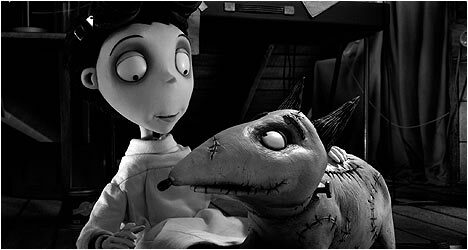 Did you worry that the story of Frankenweenie might be too dark and scary for Disney? No. In my mind, I always felt confident that it was quite a traditional Disney movie. Disney movies like Bambi and The Lion King have dealt with emotional issues that are not dissimilar in some ways. Disney films have a certain element of danger or darkness in them, and if all of that stuff was taken out of every Disney movie, they wouldn’t feel the same. Frankenweenie has got a happy ending, so I never felt like it was pushing the boundaries very much in terms of that. You’ve worked on such a wide variety of projects and movies… How does it feel when people come up to you to tell you that they identify with one of your memorable character creations? The best thing that ever happens to me is not so much about reviews or box office [takings]. I try to make the money back for each film, but the nicest thing is when you get people coming up to admit that they have a personal connection with a character. That’s really, really nice. To me, that means more than anything because that’s the reason why I do this.